Angola /æŋˈɡoʊlə/, officially the Republic of Angola (Portuguese: República de Angola pronounced: [ɐ̃ˈɡɔlɐ]; Kikongo, Kimbundu and Umbundu: Repubilika ya Ngola), is a country in Southern Africa. It is the seventh-largest country in Africa, and is bordered by Namibia to the south, the Democratic Republic of the Congo to the north and east, Zambia to the east, and the Atlantic Ocean to west. The exclave province of Cabinda has borders with the Republic of the Congo and the Democratic Republic of the Congo. The capital and largest city of Angola is Luanda. 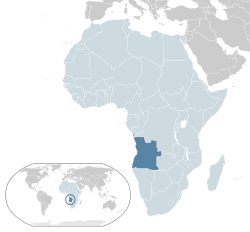 Although its territory has been inhabited since the Paleolithic Era, modern Angola originates in Portuguese colonization, which began with, and was for centuries limited to, coastal settlements and trading posts established beginning in the 16th century. In the 19th century, European settlers slowly and hesitantly began to establish themselves in the interior. As a Portuguese colony, Angola did not encompass its present borders until the early 20th century, following resistance by groups such as the Cuamato, the Kwanyama and the Mbunda. Independence was achieved in 1975 under communist rule backed by the Soviet Union after the protracted liberation war. That same year, Angola descended into an intense civil war that lasted until 2002. It has since become a relatively stable unitary presidential republic. Angola is a member state of the United Nations, OPEC, African Union, the Community of Portuguese Language Countries, the Latin Union and the Southern African Development Community. A highly multiethnic country, Angola's 25.8 million people span various tribal groups, customs, and traditions. Angolan culture reflects centuries of Portuguese rule, namely in the predominance of the Portuguese language and Roman Catholicism, combined with diverse indigenous influences. The region now known as Angola was reached by the Portuguese explorer Diogo Cão in 1484. The year before, the Portuguese had established relations with the Kingdom of Kongo, which stretched at the time from modern Gabon in the north to the Kwanza River in the south. The Portuguese established their primary early trading post at Soyo, which is now the northernmost city in Angola apart from the Cabinda enclave. Paulo Dias de Novais founded São Paulo de Loanda (Luanda) in 1575 with a hundred families of settlers and four hundred soldiers. Benguela was fortified in 1587 and elevated to a township in 1617. The Portuguese established several other settlements, forts, and trading posts along the Angolan coast, principally trading in Angolan slaves for Brazilian plantations. Local slave dealers provided a large number of slaves for the Portuguese Empire, usually sold in exchange for manufactured goods from Europe. This part of the Atlantic slave trade continued until after Brazil's independence in the 1820s. Despite Portugal's nominal claims, as late as the 19th century, their control over the interior country of Angola was minimal. In the 16th century Portugal gained control of the coast through a series of treaties and wars. Life for European colonists was difficult and progress slow. 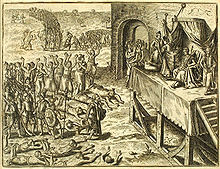 Iliffe notes that "Portuguese records of Angola from the 16th century show that a great famine occurred on average every seventy years; accompanied by epidemic disease, it might kill one-third or one-half of the population, destroying the demographic growth of a generation and forcing colonists back into the river valleys". Development of the hinterland began after the Berlin Conference in 1885 fixed the colony's borders, and British and Portuguese investment fostered mining, railways, and agriculture based on various forced-labour and voluntary labour systems. (See also Chibalo.) Full Portuguese administrative control of the hinterland did not establish itself until the beginning of the 20th century. Portugal had a minimalist presence in Angola for nearly five hundred years, and early calls for independence provoked little reaction amongst the population who had no social identity related to the territory as a whole. More overtly political and "nationalist" organisations first appeared in the 1950s and began to make demands for self-determination, especially in international forums such as the Non-Aligned Movement. The Portuguese régime, meanwhile, refused to accede to the demands for independence, provoking an armed conflict that started in 1961 when freedom fighters attacked both white and black civilians in cross-border operations in northeastern Angola. The war came to be known as the Colonial War. In this struggle, the principal protagonists included the People's Movement for the Liberation of Angola (MPLA), founded in 1956, the National Front for the Liberation of Angola (FNLA), which appeared in 1961, and the National Union for the Total Independence of Angola (UNITA), founded in 1966. After many years of conflict that weakened all of the insurgent parties, Angola gained its independence on 11 November 1975, after the 1974 coup d'état in Lisbon, Portugal, which overthrew the Portuguese régime headed by Marcelo Caetano. Portugal's new revolutionary leaders began in 1974 a process of political change at home and accepted independence for its former colonies abroad. In Angola a fight for dominance broke out immediately between the three nationalist movements. The events prompted a mass exodus of Portuguese citizens, creating up to 300 000 destitute Portuguese refugees—the retornados. The new Portuguese government tried to mediate an understanding between the three competing movements, and succeeded in getting them to agree, on paper, to form a common government. But in the end none of the African parties respected the commitments they had made, and military force resolved the issue. After it gained independence in November 1975, Angola experienced a devastating civil war which lasted several decades (with some interludes). It claimed millions of lives and produced many refugees; it didn't end until 2002. With Cuban support, the MPLA held Luanda and declared independence on 11 November 1975, with Agostinho Neto becoming the first president, though the civil war continued. At this time, most of the half-million Portuguese who lived in Angola – and who had accounted for the majority of the skilled workers in public administration, agriculture, industries and trade – fled the country, leaving its once prosperous and growing economy in a state of bankruptcy. On 22 March 2002, Jonas Savimbi, the leader of UNITA, was killed in combat with government troops. The two sides reached a cease-fire shortly afterwards. UNITA gave up its armed wing and assumed the role of major opposition party, although in the knowledge that under the present regime a legitimate democratic election was impossible. Although the political situation of the country began to stabilize, regular democratic processes were not established until the elections in Angola in 2008 and 2012 and the adoption of a new Constitution of Angola in 2010, all of which strengthened the prevailing Dominant-party system. MPLA head officials continue e.g. to be given senior positions in top-level companies or other fields, although a few outstanding UNITA figures are given some of the economic as well as the military share. Angola has a serious humanitarian crisis, the result of the prolonged war, the abundance of minefields, the continued political, and to a much lesser degree, military activities in favour of the independence of the northern exclave of Cabinda, carried out in the context of the protracted Cabinda Conflict by the Frente para a Libertação do Enclave de Cabinda, (FLEC), but most of all, the depradation of the country's rich mineral resources by the régime. While most of the internally displaced have now settled around the capital, in the so-called musseques, the general situation for Angolans remains desperate. Drought, in 2016, is the worst global food crisis in Southern Africa for 25 years. Drought affects 1.4 million people across seven of Angola’s 18 provinces. Food prices have risen and acute malnutrition rates have doubled, with more than 95,000 children being affected. Food insecurity is expected to worsen from July to the end of the year. Angola has three seasons, a dry season which lasts from May to October, a transitional season with some rain from November to January and a hot, rainy season from February to April. April is the wettest month. The Constitution of 2010 establishes the broad outlines of government structure and delineates the rights and duties of citizens. The legal system is based on Portuguese and customary law but is weak and fragmented, and courts operate in only 12 of more than 140 municipalities. A Supreme Court serves as the appellate tribunal; a Constitutional Court does not hold the powers of judicial review. Governors of the 18 provinces are appointed by the president. Angola has a rich subsoil heritage, from diamonds, oil, gold, copper, and a rich wildlife (dramatically impoverished during the civil war), forest, and fossils. Since independence, oil and diamonds have been the most important economic resource. Smallholder and plantation agriculture have dramatically dropped because of the Angolan Civil War, but have begun to recover after 2002. The transformation industry that had come into existence in the late colonial period collapsed at independence, because of the exodus of most of the ethnic Portuguese population, but has begun to reemerge with updated technologies, partly because of the influx of new Portuguese entrepreneurs. Similar developments can be verified in the service sector. Overall, Angola's economy has in recent years moved on from the disarray caused by a quarter-century of civil war to become the fastest-growing economy in Africa and one of the fastest in the world, with an average GDP growth of 20 percent between 2005 and 2007. In the period 2001–10, Angola had the world's highest annual average GDP growth, at 11.1 percent. In 2004, the Eximbank approved a $2 billion line of credit to Angola. The loan was to be used to rebuild Angola's infrastructure, and also to limited the influence of the International Monetary Fund in the country. China is Angola's biggest trade partner and export destination as well as the fourth-largest importer. Bilateral trade reached $27.67 billion in 2011, up 11.5% year-on-year. China's imports, mainly crude oil and diamonds, increased 9.1% to $24.89 billion while China's exports, including mechanical and electrical products, machinery parts and construction materials, surged 38.8%. The oil glut led to a local unleaded gasoline "pricetag" of £0.37 per gallon. The Economist reported in 2008 that diamonds and oil make up 60% of Angola's economy, almost all of the country's revenue and are its dominant exports. Growth is almost entirely driven by rising oil production which surpassed 1.4 million barrels per day (220,000 m3/d) in late 2005 and was expected to grow to 2 million barrels per day (320,000 m3/d) by 2007. Control of the oil industry is consolidated in Sonangol Group, a conglomerate owned by the Angolan government. In December 2006, Angola was admitted as a member of OPEC. However, operations in diamond mines include partnerships between state-run Endiama and mining companies such as ALROSA which continue operations in Angola. The economy grew 18% in 2005, 26% in 2006 and 17.6% in 2007. However, due to the global recession the economy contracted an estimated −0.3% in 2009. The security brought about by the 2002 peace settlement has led to the resettlement of 4 million displaced persons, thus resulting in large-scale increases in agriculture production. Although the country's economy has developed significantly since it achieved political stability in 2002, mainly thanks to the fast-rising earnings of the oil sector, Angola faces huge social and economic problems. These are in part a result of the almost continual state of conflict from 1961 onwards, although the highest level of destruction and socio-economic damage took place after the 1975 independence, during the long years of civil war. However, high poverty rates and blatant social inequality are chiefly the outcome of a combination of a persistent political authoritarianism, of "neo-patrimonial" practices at all levels of the political, administrative, military, and economic apparatuses, and of a pervasive corruption. The main beneficiary of this situation is a social segment constituted during the last decades, around the political, administrative, economic, and military power holders, which has accumulated (and continues accumulating) enormous wealth. "Secondary beneficiaries" are the middle strata which are about to become social classes. However, overall almost half the population has to be considered as poor, but in this respect there are dramatic differences between the countryside and the cities (where by now slightly more than 50% of the people live). According to The Heritage Foundation, a conservative American think tank, oil production from Angola has increased so significantly that Angola now is China's biggest supplier of oil. “China has extended three multibillion dollar lines of credit to the Angolan government; two loans of $2 billion from China Exim Bank, one in 2004, the second in 2007, as well as one loan in 2005 of $2.9 billion from China International Fund Ltd.”  Growing oil revenues have also created opportunities for corruption: according to a recent Human Rights Watch report, 32 billion US dollars disappeared from government accounts from 2007 to 2010. Furthermore, Sonangol, the state run oil company, has control of 51% of Cabinda’s oil. Due to this market control the company ends up determining the profit given to the government and the taxes paid. The council of foreign affairs states that the World Bank mentioned that Sonangol " is a taxpayer, it carries out quasi-fiscal activities, it invests public funds, and, as concessionaire, it is a sector regulator. This multifarious work program creates conflicts of interest and characterizes a complex relationship between Sonangol and the government that weakens the formal budgetary process and creates uncertainty as regards the actual fiscal stance of the state." Before independence in 1975, Angola was a breadbasket of southern Africa and a major exporter of bananas, coffee and sisal, but three decades of civil war (1975–2002) destroyed fertile countryside, left it littered with landmines and drove millions into the cities. The country now depends on expensive food imports, mainly from South Africa and Portugal, while more than 90% of farming is done at thefamily and subsistence level. Thousands of Angolan small-scale farmers are trapped in poverty. Angola's economy is expected to grow by 3.9 percent in 2014 said the International Monetary Fund (IMF). According to the Fund, robust growth in the non-oil economy, mainly driven by a very good performance in the agricultural sector, is expected to offset a temporary drop in oil production. Agriculture and forestry is an area of opportunity for the country. “Angola requires 4.5 million tonnes a year of grain but only grows about 55% of the corn it needs, 20% of the rice and just 5% of its required wheat”(African economic Outlook) but “less than 3 percent of Angola's abundant fertile land is cultivated and the economic potential of the forestry sector remains largely unexploited” (World Bank). From this fact we can appreciate the capacity that Angola has to increase production not only for the national market but also for the international one. Investing in this sector can help reduce unemployment and more specifically in the rural areas. This will undoubted have consequences on the living standard of rural civilians. On 11 March 2015, the First Angolan Forum of Telecommunications and Information Technology was held, in Luanda under the motto "The challenges of telecommunications in the current context of Angola". The purpose of this forum was to promote the debate on topical issues on telecommunications in Angola and worldwide. A study about this sector was also presented at this forum, and some of its conclusions were: Angola had the first telecommunications operator in Africa to test the High Speed Internet technology (LTE-Advanced with speeds up to 400Mbit/s); It has a mobile penetration rate of about 75%; There are about 3.5 million smartphones in the Angolan market; There are about 25,000 kilometres (16,000 miles) of optical fiber installed in the country. Angola has a population of 24,383,301 inhabitants according to the preliminary results of its 2014 census, the first one conducted or carried out since 15 December 1970. It is composed of Ovimbundu (language Umbundu) 37%, Ambundu (language Kimbundu) 23%, Bakongo 13%, and 32% other ethnic groups (including the Chokwe, the Ovambo, the Ganguela and the Xindonga) as well as about 2% mestiços (mixed European and African), 1.6% Chinese and 1% European. The Ambundu and Ovimbundu ethnic groups combined form a majority of the population, at 62%. The population is forecast to grow to over 60 million people to 2050, 2.7 times the 2014 population. However, on March 23, 2016, official data revealed by Angola's National Statistic Institute - Instituto Nacional de Estatística (INE), states that Angola has a population of 25.789.024 inhabitants. 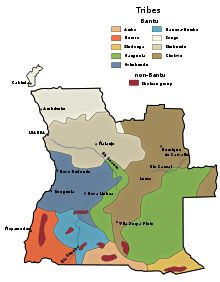 The languages in Angola are those originally spoken by the different ethnic groups and Portuguese, introduced during the Portuguese colonial era. The most widely spoken indigenous languages are Umbundu, Kimbundu, and Kikongo, in that order. Portuguese is the official language of the country. Mastery of the official language is probably more extended in Angola than it is elsewhere in Africa, and this certainly applies to its use in everyday life. Moreover, and above all, the proportion of native (or near-native) speakers of the language of the former colonizer, become official after independence, is no doubt considerably higher than in any other African country. In the same late colonial period, the legal discrimination of the black population was abolished, and the state apparatus in fields like health, education, social work, and rural development was enlarged. This entailed a significant increase in jobs for Africans, on condition that they spoke Portuguese. As a consequence of all this, the African "lower middle class" which at that stage formed in Luanda and other cities began to prevent their children from learning the local African language, in order to guarantee that they learned Portuguese as their native language. At the same time, the white and "mestiço" population, where some knowledge of African languages could previously often be found, neglected this aspect more and more, to the point of frequently ignoring it totally. These tendencies continued and grew under the rule of the MPLA whose main social roots are exactly in those social segments where the mastery of Portuguese as well as the proportion of native Portuguese speakers was highest. This became a political side issue, as FNLA and UNITA, given their regional constituencies, came out in favour of a greater attention to the African languages, and as the FNLA favoured French over Portuguese. The exact numbers of those fluent in Portuguese or who speak Portuguese as a first language are unknown, although a census is expected to be carried out in July–August 2013. Quite a number of voices demand the recognition of "Angolan Portuguese" as a specific variant, comparable to those spoken in Portugal or in Brazil. However, while there exists a certain number of idiomatic particularities in everyday Portuguese, as spoken by Angolans, it remains to be seen whether or not the Angolan government comes to the conclusion that these particularities constitute a configuration that justifies the claim to be a new language variant. There are about 1000 mostly Christian religious communities in Angola. While reliable statistics are nonexistent, estimates have it that more than half of the population are Catholics, while about a quarter adhere to the Protestant churches introduced during the colonial period: the Congregationalists mainly among the Ovimbundu of the Central Highlands and the coastal region to its West, the Methodists concentrating on the Kimbundu speaking strip from Luanda to Malanje, the Baptists almost exclusively among the Bakongo of the Northwest (now present in Luanda as well) and dispersed Adventists, Reformed and Lutherans. In Luanda and region there subsists a nucleus of the "syncretic" Tocoists and in the northwest a sprinkling of Kimbanguism can be found, spreading from the Congo/Zaïre. Since independence, hundreds of Pentecostal and similar communities have sprung up in the cities, where by now about 50% of the population is living; several of these communities/churches are of Brazilian origin. A yellow fever outbreak in Angola began in December 2015. Nearly 4000 people were suspected of being infected as of August 2016 when the outbreak began to subside. As many as 369 may have died from yellow fever. The outbreak began in the capital of Luanda but spread to at least 16 of the 18 provinces in the country. This outbreak of the yellow fever is the worst in the southern African country in three decades.